The coming two days I will participate in a two-day workshop of the Eritrean Tourism Service Association (ETSA) and the Eritrean government in Hotel Intercontinental Asmara. ETSA is an organization of tourism service providers: hotels, restaurants, travel agencies, car-hire, bars, entertaining centers, railways and of course Eritrean Airlines. 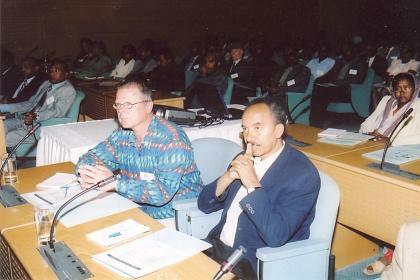 And since providing tourist information about Eritrea - even though it is just a hobby - is also recognized as providing a service, I am happy to be invited by Mr. Solomon Abraha, chairman of the ETSA, and manager of the Embasoira Hotel, to participate in this weeks program, on the occasion of World Tourism Day 2004. After the opening ceremony with speeches of Mr. Mohammed Idris Ibrahim of the Ministry of Tourism and Mr. Solomon Abraha, chairman of the ETSA, papers are presented by Dr. Girmay Abraham (Ministry of National Development), Mr. Kefleyesus Abraha (Ministry of Tourism), Mr. Amanuel Paulos (National Security Agency), Mr. Habtom Zerai (Ministry of Foreign Affairs), Mr. Mebrahtu Abraha (Cultural Heritage Rehabilitation Project, Mr. Ermias Habte (Department of Environment), Mr. Solomon Tewolde (Ministry of Transport and Communication) and Mr. Yosef Mobae (National Museum). 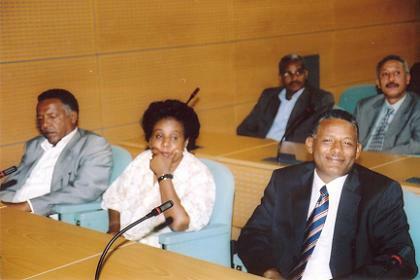 They all give a sound presentation about the role of their organization in the development of tourism in Eritrea. During the discussions and the tea and lunch breaks I am glad to have an opportunity to chat and exchange ideas with the various participants about Eritrea's tourist potential and the measures to develop this smokeless and promising industry. In the lunch break the Berhe Aiba Hotel serves a perfect buffet lunch to the group. The casual setting lent itself to a friendly conversation while eating local food. I share a table with hotel managers and representatives of the Eritrean government, which gives me a perfect opportunity to get insight in both the challenges and suggested improvements of this fast expanding sector. 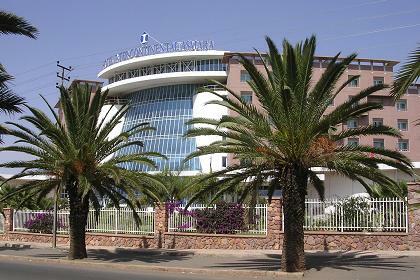 Hotel Intercontinental hosting the ETSA workshops - Asmara Eritrea. Workshop of the Eritrean Tourism Service Association - Asmara Eritrea. Photo by Ghirmay - Photo Asmarina - Asmara. Workshop of the Eritrean Tourism Service Association Asmara Eritrea. 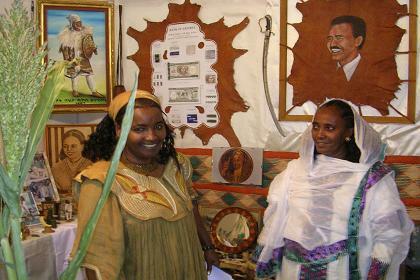 "zuria" - ETSA exhibition - Expo area, Asmara Eritrea. 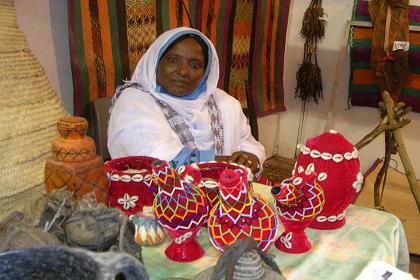 Traditional Eritrean handicrafts, ETSA exhibition - Asmara Eritrea. 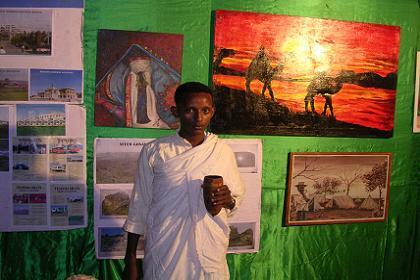 Eritrean artist showing his work, ETSA exhibition - Asmara Eritrea. 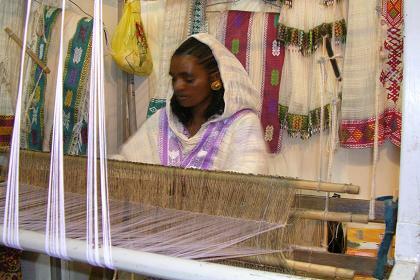 Eritrean handicraft (Keren), ETSA exhibition - Asmara Eritrea. 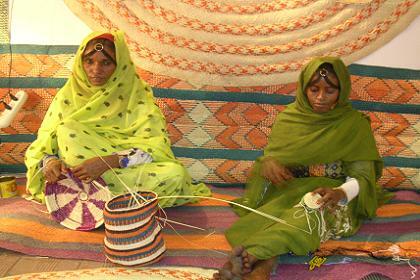 Eritrean handicraft (Agordat), ETSA exhibition - Asmara Eritrea. 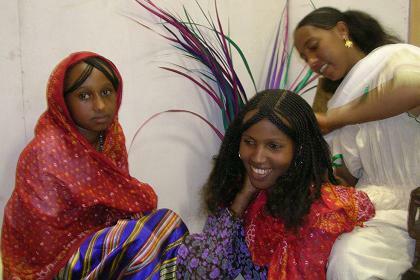 Eritrean traditional hair dresser, ETSA exhibition - Asmara Eritrea. 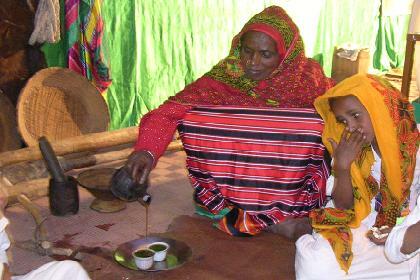 Eritrean coffee ceremony, ETSA exhibition - Asmara Eritrea.